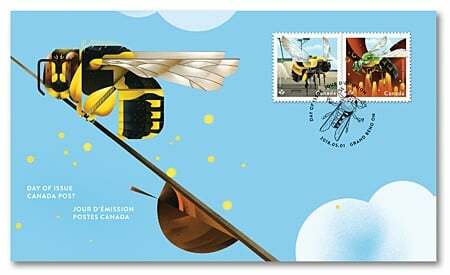 I’m not sure if Canada Post will have a new bee stamp for International Bee Day for May 20th, but they issued a couple of interesting ones last year. These two stylized permanent stamps (forever stamps) were released May 1st 2018 and they’re kind of cool. 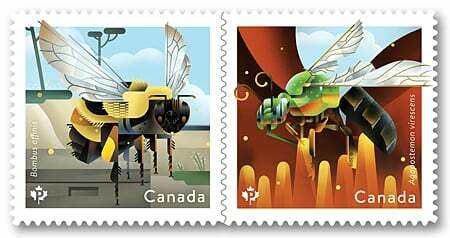 Designed by Andrew Perro and illustrated by Dave Murray, the stamps show a bumble bee (currently on the endangered species list in Canada) and a metallic green bee, which is a type of sweat bee in all it’s vivid colours. The cancel on the FDC is great! They did a good job on this set although there isn’t a lot of room for the address. 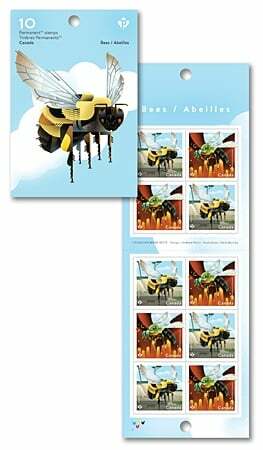 They can still be purchased via Canada Post’s online shop.